The soft color and muted strokes of watercolor magically capture the movement, sound and mood expressed in the painted works of Sally Baldino. A devoted watercolorist for many years, Sally portrays the scenic landscapes and dramatic settings recalled from her extensive travels in the Mediterranean, Europe and North America.Her most recent works celebrate the images of Tuscany and Lake Como. 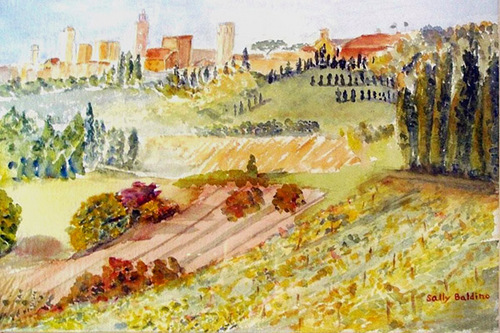 One of her Tuscan landscapes was published in the April, 2002, issue of Victoria Magazine. Sally has studied with professional artists Judi Wagner, Judi Betts, Robert Dodge, Frank Webb. Timothy Clark, and Joseph Bohler.She has completed classes at the Pennsylvania Academy of Fine Arts in Philadelphia. She is member of ARTSBRIDGE, Lambertville, NJ, Artists of Yardley and Chester County Art Association.